Thank you for helping us raise awareness during Pancreatic Cancer Awareness Month! We participated in a lot of great awareness activities—from ringing the closing bell at Nasdaq to appearing at Good Morning America, before ending the month on camera at a Rangers game at Madison Square Garden to highlight the incredible pancreatic cancer research that the Foundation is funding. We are grateful to all of you who shared our survivor stories on social media and posted photos wearing purple for World Pancreatic Cancer Day. We are also thankful for the researchers at our dedicated labs for the awareness they bring to this disease every day. Members of the Lustgarten Foundation and Let’s Win Pancreatic Cancer ring the closing bell at Nasdaq for Pancreatic Cancer Awareness Month. 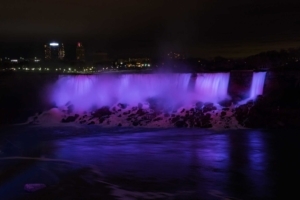 Niagara Falls was turned purple for World Pancreatic Cancer Day. Actress Debra Messing wears her Bunny Eyez glasses in the Lustgarten Foundation’s signature purple. Twenty percent of the profit from the sale of each pair of the custom Anna reading glasses will benefit the Foundation and pancreatic cancer research. Thank you, Michael Ealy, for your support on World Pancreatic Cancer Day! View post. Thank you, Good Morning America and Robin Roberts, for helping us raise awareness on World Pancreatic Cancer Day. View post. Some of our researchers shared photos wearing purple for World Pancreatic Cancer Day, too! View post.